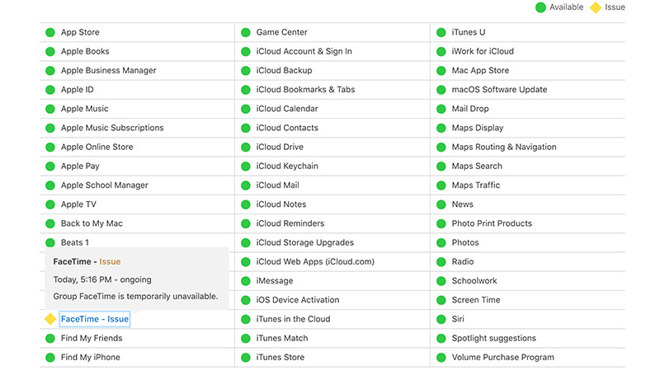 Apple's System Status webpage shows Group FaceTime as unavailable. Apple quietly announced the takedown on its System Status webpage, which as of this writing shows Group FaceTime as unavailable due to an "ongoing issue." The company does not offer a timeline on a resolution, though a fix to the underlying flaw is in the works. First documented by Benji Mobb on Twitter, anyone can activate the glitch by calling another FaceTime user and manually adding the originating number to the call as a third party. Once added, access to the recipient's microphone is granted even if they do not answer the call. Through further experimentation it was discovered that camera access is also granted -- however briefly -- when a recipient presses iPhone's power or volume buttons to decline the incoming call. Considering the ramifications of allowing interlopers easy access to microphone and camera hardware, and Apple's staunch commitment consumer privacy, the Group FaceTime takedown does not come as a surprise. I hoped they would be able to deactivate the service on the server side without needing to do an update. They may also be able to introduce a block preventing the step of adding your own number to the call. Thank god they disabled this scary bug. This bug should be easy to fix though... good thing the feature is disabled in the meantime. Queue lawsuits... because this is is ambulance chasing America. Mr. Cook grandstands as social activist and prattles on about privacy while his bungling engineers have turned the iPhone into a remotely controlled eavesdropping device. This shocking bug is going to hit the front page, apple just can't get a break these days. They've never been very good at building cloud services, going to get mocked for a long while on this one. At least this is a bug, and not a feature. Please trust me when I say I'm a huge Apple fan, but surely at this point there's a growing number of people who agree with the argument that Tim Cook must go? I want Apple to thrive but collapsing quality, pace of design, and terrible pricing strategies are now real problems. Yes, let's fire the CEO for a "bug" that is sold as products from Google, Amazon, and Facebook that are eavesdropping 24/7. Makes sense - a software error means they cannot POSSIBLY be serious about privacy! I'm sure they are lining up to hear your opinion. Tim Cook has made Apple hundreds of billions of dollars. There is no "collapsing quality." WTF are you talking about? Isolated product issues? And, terrible pricing strategies? Again, WTF are you talking about? Wow - didn't expect that level of sarcasm and 'WTFs' after one comment. When I say collapsing quality, I'm referring to what started as a personal experience - as a past user of iTunes match, my entire Apple Music library was scrambled (a widespread issue) - it then took dealing with an apple engineer for over a year for them to finally accept that the issues were not resolvable, having tried many times to pitch bugs as features to me, and for them to recommend that I abandon my Apple ID as the same bugs were becoming evident across multiple iCloud features, including photos and documents. Since then, we've seen a litany of software failures - iOS 11 was so buggy that the majority of user-facing changes for iOS 12 were pushed back a year. Craig Federighi had to apologise just over 12 months ago for the critical root vulnerability, there have been numerous issues since then - now this. These are no longer isolated cases - we're seeing sustained failures in quality control. I can criticise Apple's execution without that meaning I'm supporting other operating systems or business models. And Tim Cook has grown Apple sure, but he's done it by milking IP and innovations from the Job era. When I say the failed pricing strategy, I'm referring to how this evening we're expecting YOY iPhone revenue to be down 33% - almost no analysts accept Cook's defence that this is solely down to China. I actively agree that Cook was the right person to steer the ship for the first 7 years since Jobs, but I don't think this quality is acceptable and I think someone with vision for the future needs to step in. Can I genuinely and politely ask that if you disagree, can you just argue your point calmly without things like 'WTF' - I don't see why we can't discuss and debate without respect. It's actually not that scary - there's no way for anyone to pull this off without you knowing since they have to initiate a facetime call. 8 days is a short amount of time for things to go public. Typically the responsible disclosure guidelines are a month or more. That's so that security teams can find ways to address the issues without having to disrupt people using the service normally. Yes, this is a BAD bug, no question about it, and it's one that will haunt them for a while, and should've been caught during development, especially considering how long Group FaceTime was delayed for. But in the end, Apple quickly acknowledged it, and even went as far as to shut down the offending system to prevent this from becoming an actual issue. And yet now we have calls all over the Internet to have Tim Cook and Jonathan Ive's head's on the proverbial silver platters over this, what idiotic BS! How many other MASSIVE privacy snafus and monumental bugs made their way into MS and Google products over the years, some of which remain to this day (Stagefight ring a bell? ), yet no one calls for those engineers or CEO's heads? "Who would have thought to test that?" This is exactly what you expect an inexperienced engineer to respond. Or a small basement company. Apple are, for good reasons, held to higher standards. It shouldn't have mattered if this particular test was written or not, good engineering practice should have ensured that the mic or camera could _never_ be enabled without active users permission (in this case answering the call). There is no escaping that Apple''s SW problems are not (only) a QA issue, but is based in sloppy developer habits and poor management (not necessarily on top but at least on team level). Darn it. And I was planning on calling 50 people at random for a Group FaceTime later. A nice, simple "experienced engineer's" solution to a problem... that's not really that simple. Which switches the issue from simply "enabling" the microphone to under what circumstances is the data stream routed. Further, I'd suspect preliminary streams for video and audio are being setup between all of the participants while the call is being initiated in order to enable "instant" communication and high QOS once the call is actually accepted by all of the parties involved. So was it "sloppy" engineering or an emergent, unexpected behavior among quite a few highly complex systems? But hey, let's go with the armchair engineer's solution, especially since it fits so nicely with their preconceptions. You can think Apple's software quality is currently poor and not be a troll. I think it's currently poor and am a long time supporter who's read this site daily for over a decade because I'm passionate about Apple at its best. I also don't understand the argument that it's ok because it happens to Microsoft and Google? The whole incredible thing about Apple has historically been because they operated at a level where this type of thing very rarely happened. It now quite commonly happens - I'm not looking at this in a vacuum, it's not 'one little thing', it's a developing trend. I don't see how it's 'idiotic' to question whether Tim Cook is the right leader now when he's ultimately responsible for every aspect of the company's performance.